Your home from home during your stay with Shaka Surf Morocco will be the beautiful surf riad, based in the village of Tamraght, located just a short 10 minute walk to the beach and a 5 minute walk to the local shops and cafes. Our accommodation offers a wide range of room options (single, double, twin, triple, quad) making it the perfect choice for solo travellers, friends, couples and families. The traditional Moroccan riad layout means that the rooms are all based off a central courtyard surrounding a peaceful pool and garden. The two beautiful roof terraces offer you additional areas to relax and socialise, as well as great spots to watch the sun setting. All rooms a equipped with a private ensuite bathroom and include bed linen, shower towels and room servicing. Please note that for all of our bookings we operate as standard with two persons to a room, unless otherwise specified. If you are booking as a solo traveller, we will place you in a room with another person of the same gender, if this is not possible then you will be placed in a private room. Single room upgrades are available on request, for an additional fee. We know the importance of a good start to the day, that's why we offer our breakfast buffet style, allowing you to choose from a range of bread, spreads, cereals, yogurts, seasonal fruits and eggs, as well as tea and coffee. Lunches are served picnic style at the beach, we provide you with sandwiches, salads or pasta, as well as a selection of fresh fruits, nuts, dates and local treats. Lastly, our dinners – they are big, hearty and packed with healthy Moroccan produce and flavours. 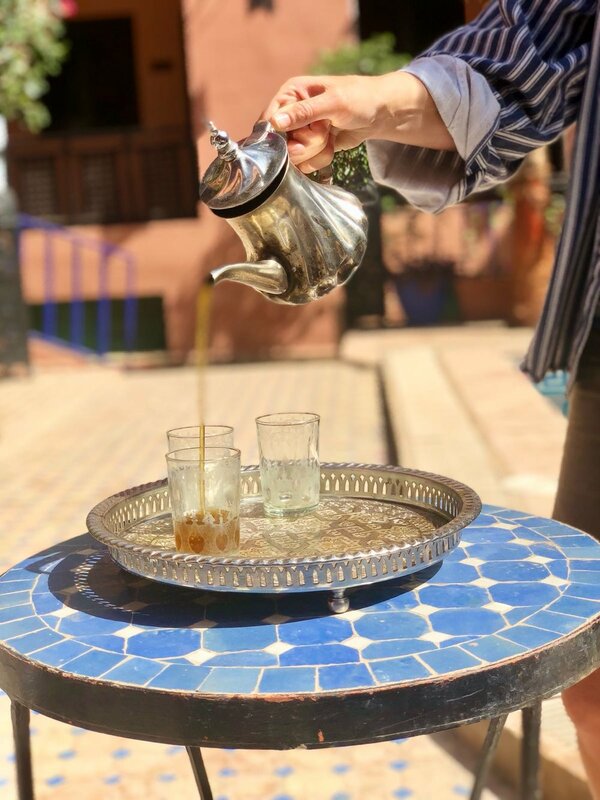 The majority of your dinners will be served at the riad, but for one of your nights we take you to dinner at selected local restaurant - showing you our favourite food spots and also helping to support another local business. We are able to cater for all dietary requirements, if you have any specific needs just let us know on booking and we will make sure you receive tailored meals throughout your stay.